Complete as many reps as possible in 14 minutes. Begin with one rep of each exercise and add 1 rep of each until the 14 minutes has expired. 10 rounds for time on each round. Start at 60% of 1RM and go as heavy as possible. Men use a 75lb barbell. 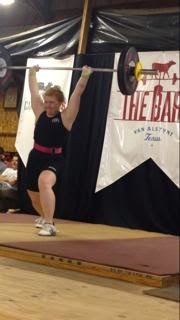 Women use a 55lb barbell. GO SPEND THE DAY WITH YOUR MOM! If you have a 20lb vest, wear it.